10th and 11th November 2018 at Olympia London. The UK's best drum show is back for 2018! Beginners and experts alike can enjoy watching top drummers perform across three stages, trying out and buying a huge range of drums, sticks, accessories and loads more drumming kit, and learning from some of the best educators and clinicians in the world. 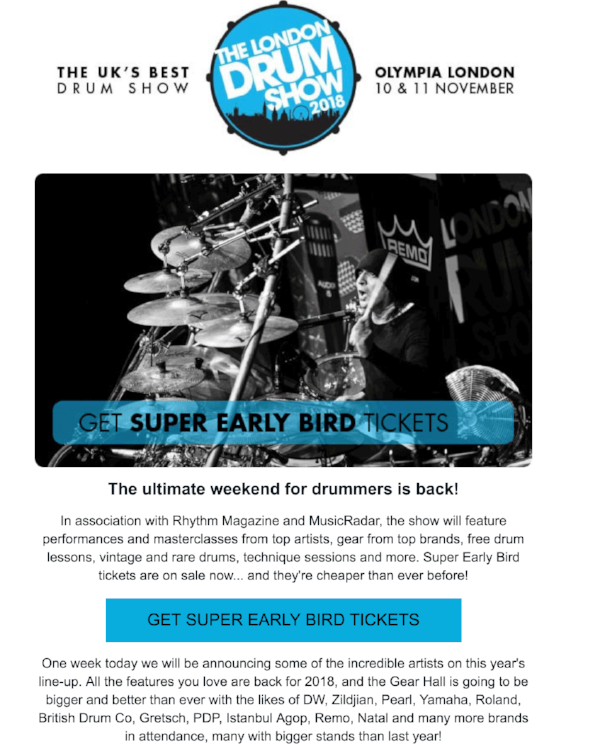 The London Drum Show is a great day out for families, drumming enthusiasts and professional drummers. Whether you're a serious player searching for the perfect drumhead or you want to have a bit of fun trying out a double drum kit or becoming a Rhythm Magazine cover star in Natal's Photo Booth, there's something for everyone at the show. Some of the biggest names in drumming will be holding Main Stage, Masterclass and Education Zone sessions, many offering audiences the opportunity for an up-close-and-personal Q&A. Keep an eye out for artist announcements which we will be revealing in the coming months. Following the success of the last recording sessions Alan & I have set the date of SUNDAY 11TH JUNE for the next session. As before each drummer will have an hour to record up to 3 songs of their choice over the available backing tracks. GRADE SONGS – Those students who are about to sit their Summer Grade Exam may wish to record their chosen grade songs (inc. Hot Rock Tracks) in preparation for the exam. SOUND-ALIKE TRACKS – We have prepared over 150 backing tracks of popular Rock, Pop, Soul & Blues songs, chosen for their drum rhythms. These tracks are covers of the originals without vocals. To access this list follow the link drumology.org.uk/recording. You will need your Access Code to view the list. If you have forgotten your code text me & I will send it straight away. KARAOKE-VERSION – This is a website that has 100’s & 100’s of downloadable songs without drums that we can use for recording. Visit karaoke-version.co.uk, click on the “Drums” tab at the top & search for your chosen song. You can hear a demo of the song with & without drums. All the tracks come with vocals & are covers of the originals. 1) Contact me & let me know what time of day suits you best & I will put your name on the timetable. 2) Decide on what 3 songs you want to do & let me know a.s.a.p. as I have to score the drum part for you to learn. Don't Practice Until You Can Get it Right...Practice Until You Can't Get it Wrong! Q - Why should I practice? A – Practice is the ONLY way you will improve your drumming skills & become able to creatively express yourself on the drum set. Q – How often should I practice? A – As far as possible, practice every day. Q – How long should I practice for? Grade 7 to Grade 8 – 1 hour per day or more. Q – How should I practice? A – Plan your practice time by dividing your practice time into 6-minute segments, use “Stone’s Method” & focus only on those areas of your playing that need attention. Remember, “Repetition is the Mother of Skill”. Q – Do I need to use the metronome? A – Absolutely, all the time. The metronome will develop your sense of timing, which is essential for a drummer. Q – What happens if I don’t practice? A – You actually get worse, because, over time, your muscles forget any training you have given them. Worse still you’re your benefactor may remove their funding & sell your drum kit! Q – Is it practice when I play my favourite songs & play all the licks & fills I’m good at? A – Not really, playing stuff you can do is “self-entertainment”. It is important to play fun stuff because playing drums is fun, but it is not practice. Q – What can I do if I want to practice but I can’t get on the drum kit because everyone is at home & complaining it’s too noisy? A – Use your practice pad. For a full explanation of how to make your practice routine effective & how to use “Stones Method” go to Drumology.org.uk/guides & enter your pass code. Rock School Applications for Graded Exams are closing on 1st April 2017 so CLICK HERE the link for more details. The RCM Festival of Percussion returns with special guest, the international rock, jazz, classical and funk drummer Benny Greb. The jam-packed day features O Duo with the Band of the Royal Air Force Regiment, drummer and RCM professor Ralph Salmins performing with three different groups, top percussion quartet Amadinda, and Brazilian workshops with The Lion King percussionist Damien Manning. The Festival also includes the RCM Trade Fair with leading UK instrument manufacturers, family workshops and the chance to try out the RCM’s performance simulator. Please note that there is limited capacity for many of these events, including the family workshops, and entry will be on a first-come-first-served basis on the day. Representatives from some of the world’s leading percussion companies will be exhibiting a range of instruments, mallets, accessories and publications. In true festival fashion, you can join in with book signings. Following the release of their first studio album ‘Don le Bunk’, join the trio plus a few special guests for this clinic on groove concepts, time playing and styles, and playing as part of a group. Come as a family and try out a host of percussion instruments including marimbas, drum kits, cajons and the gamelan. A series of mind-blowing performances from some of the UK’s top young percussion groups. Witness favourite orchestral repertoire performed by world-class percussionists. The Band of the Royal Air Force Regiment join forces with O Duo and RCM percussionists for an entertaining, family-friendly concert featuring special arrangements of tunes from Riverdance and Mary Poppins, a xylophone extravaganza and audience participation! Celebrating 25 years as an RCM percussion professor, Ralph Salmins plus members of his rhythm section host an interactive class for aspiring players on the feel, dynamics and rhythm section concepts. Legendary drummer Benny Greb talks to Mike Dolbear before taking us through some of the incredible techniques that have led to him becoming one of the world’s most famous drummers and drum clinicians. Learn how to play samba with The Lion King percussionist Damien Manning. Don’t miss this opportunity to see this performance by Hungarian percussion ensemble Amadinda – regarded as one of the most original and versatile percussion groups in the world. Grab a drink and relax with a mix of original tunes and jazz standards. For our grand finale, we welcome back special guest Benny Greb for a tribute to Buddy Rich, in the centenary year of his birth, directed by the brilliant Guy Barker. Includes entry to all daytime events and the evening RCM Big Band concert. Add both events to online basket to receive automatic discount.